امروزه، شبکه‌های اجتماعی و از آن جمله تلگرام، جزء جدایی‌‌ناپذیر زندگی بسیاری از دانشجویان شده‌اند و این در حالی است که استفاده دانشجویان از این شبکه‌ها در زمینه فعالیت‌‌های آموزشی و درسی بسیار ناچیز است. بر این اساس و با در نظر گرفتن اهمیت قصد رفتاری به عنوان قوی‌‌ترین متغیر پیش‌بینی‌‌کننده رفتار افراد، پژوهش حاضر با هدف بررسی عوامل مؤثر بر قصد استفاده از شبکه اجتماعی تلگرام در فعالیت‌‌های آموزشی در میان دانشجویان انجام گرفته است. جامعه آماری پژوهش را 767 نفر از دانشجویان کارشناسی ارشد رشته‌های کشاورزی دانشگاه فردوسی مشهد تشکیل داده‌اند که 196 نفر از آنان با روش نمونه‌گیری طبقه‌ای، با انتساب متناسب انتخاب شده‌اند. نتایج نشان می‌دهد که متغیرهای برداشت ذهنی از مفید بودن استفاده و همچنین برداشت ذهنی از جذابیت استفاده و نگرش اثر مثبت و معناداری بر قصد استفاده دانشجویان از شبکه اجتماعی تلگرام در فعالیت‌‌های آموزشی داشته‌اند. 1Associate Prof. in Agricultural Extension & Education, Zanjan Uni. 2Assistant Prof. in Agricultural Extension & Education, Zanjan Uni. Today, social networks, including Telegram, have become an integral part of many university students’ life; however, using these networks for educational purpose is too low to mention. Given the significance of intentional behavior as the strongest variable predicting individuals’ behavior, the present research aims to study factors affecting the intention of students using Telegram. The population consisted of 767 M.S. students majoring in agriculture in Mashhad Ferdowsi University, of which 196 individuals were selected using stratified sampling method. Findings indicate that such variables as perceived usefulness and attractiveness as well as positive affect attitude and meaningfulness have to do with the intention of students using Telegram for educational purposes. آریانی، ابراهیم؛ زاهد بابلان، عادل؛ معینی‌کیا، مهدی و خالق‌خواه، علی. (1394). نقش شبکه‌های اجتماعی مجازی در قابلیت‌های پژوهشی دانشجویان تحصیلات تکمیلی. فصلنامه یادگیری الکترونیکی، 6 (2)، صص 39-26. اسماعیلی، امیررضا. (1394). از دهستان وایبر تا شهر تلگرام چه گذشت؟. ماهنامه وب، 166، صص 74-68. پهلوان‌شریف، سعید و مهدویان، وحید. (1394). مدل­‌سازی معادلات ساختاری با AMOS. تهران: بیشه. چراغ ملایی، لیلا؛ کدیور، پروین و صرامی، غلامرضا. (1393). استفاده از شبکه‌های اجتماعی مجازی در آموزش: فرصت‌ها و چالش­‌ها. 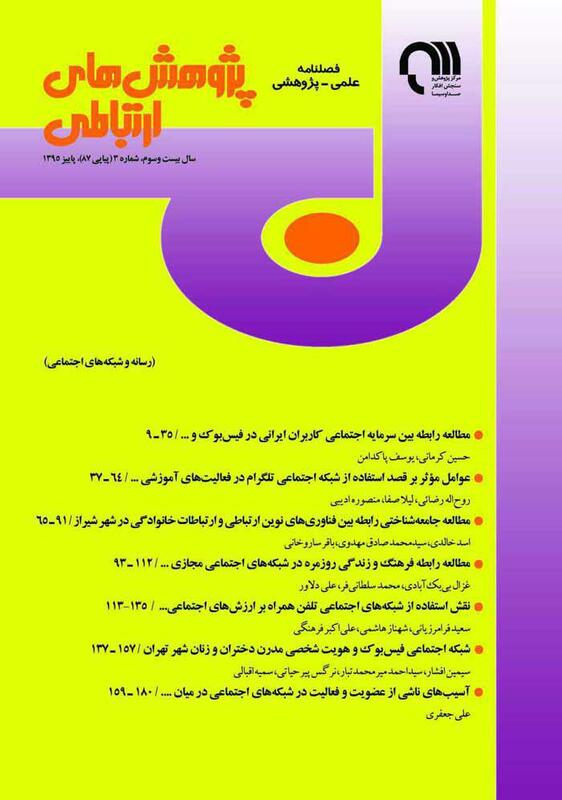 فصلنامه اندیشه‌های نوین تربیتی، 10 (3)، صص 51-29. خلیلی، لیلا. (1394). استفاده دانشجویان از شبکه­‌های اجتماعی. فصلنامه تعامل انسان و اطلاعات، 2 (1)، صص 73-59. ذکایی، محمدسعید و حسنی، محمدحسین. (1394). رسانه­‌های اجتماعی: مفهوم­‌سازی و گونه­‌شناسی (مطالعه دانشجویان دانشگاه تهران). فصلنامه پژوهش­‌های ارتباطی، 22 (4)، صص 95-77. رضایی، مسعود. (1388). نظریه­‌های رایج درباره پذیرش فناوری‌­های اطلاعات و ارتباطات. فصلنامه پژوهش­‌های ارتباطی، 16 (4)، صص 93-63. زاهد بابلان، عادل؛ معینی­‌کیا، مهدی؛ خالق‌خواه، علی و آریانی، ابراهیم. (1393). اهمیت و ضرورت شبکه­‌های اجتماعی مجازی به عنوان ابزاری برای آموزش و یادگیری. مجموعه مقالات همایش ملی مهندسی رایانه و مدیریت فناوری اطلاعات. تهران: شرکت علم و صنعت طلوع فرزین. طباطبایی‌نسب، سیدمحمد؛ اردکانی، سعید و نیکزاد، فاطمه. (1392). مقایسه مدل پذیرش تکنولوژی و تئوری عمل مستدل در رابطه با پذیرش تبلیغات موبایلی. فصلنامه تحقیقات نوین بازاریابی، 3 (4)، صص 196-181. عزت­‌زاده، مستوره؛ ربیعی، علی؛ فرهنگی، علی‌اکبر و سلطانی­‌فر، محمد. (1394). رتبه‌بندی میزان موفقیت شبکه­‌های اجتماعی در ایفای نقش آموزشی از نظر نخبگان رسانه. فصلنامه راهبرد اجتماعی ـ فرهنگی، 5 (17)، صص 111ـ 95. فیروزآبادی، ابوالحسن. (1394). سخنرانی در همایش شبکه‌های اجتماعی مجازی: فرصت­‌ها و تهدیدها. بازیابی شده: سایت خبری تابناک، پنجم دی ماه. مرکز افکارسنجی دانشجویان ایران. (1394). بررسی روندی دیدگاه مردم نسبت به شبکه‌های اجتماعی و میزان مصرف آن. تهران: مرکز افکارسنجی دانشجویان ایران وابسته به جهاد دانشگاهی. مکی­‌زاده، فاطمه. (1394). بررسی عوامل مؤثر بر قصد استفاده از شبکه­‌های اجتماعی در بین دانشجویان دانشگاه یزد. فصلنامه پژوهش‌های ارتباطی، 22 (2)، صص 140-123. مهرگان، محمدرضا و زالی، محمدرضا. (1385). در جستجوی فنون تعیین روایی در پژوهش‌های مدیریتی. فصلنامه فرهنگ مدیریت، 4 (14)، صص 26-5. Abdullah, F. & Ward, R. (2016). Developing A General Extended Technology Acceptance Model For E-Learning By Analyzing Commonly Used External Factors. Computers in Human Behavior, Vol. 56, No. 2, Pp. 238-256. Acarli, D. & Saglam, Y. (2016). Investigation of Pre-Service Teachers’ Intentions To Use of Social Media in Teaching Activities Within The Framework of Technology Acceptance Model. Procedia-Social and Behavioral Sciences, Vol. 176, Pp. 709-713. Bartlett, J.; Kotrlik, J. & Higgins, C. (2001). Organizational Research: Determining Appropriation Sample Size in Survey Research.Information Technology, Learning, and Performance Journal, Vol. 19, No. 1, Pp. 43-50. Bicen, H. (2015). Determination of University Students’ Reasons of Using Social Networking Sites in Their Daily Life. Procedia-Social and Behavioral Sciences, Vol. 190, Pp. 519-522. Chang, C.; Hung, S.; Cheng, M. & Wu, C. (2015). Exploring the Intention to Continue Using Social Networking Sites. Technological Forecasting & Social Change, Vol. 95, Pp. 48-56. Chen, B. & Bryer, T. (2012). Investigating Instructional Strategies for Using Social Media in Formal and Informal Learning. The International Review of Research in open and Distributed Learning, Vol. 13, No. 1, Pp. 87-104. Cheng, S.; Chen, S. & Yen, D. (2015). Continuance Intention of E-Portfolio System: A Confirmatory and Multi-Group Invariance Analysis of Technology Acceptance Model. Computer Standards & Interfaces, Vol. 42, Pp. 17-23. Davis, F. (1989). Perceived Usefulness, Perceived Ease of Use, and User Acceptance of Information Technology. MIS Quarterly, Vol. 13, No. 3, Pp. 319-340. Davis, F.; Bagozzi, R. & Warshaw, P. (1992). Extrinsic and Intrinsic Motivation to use Computers in the Workplace1. Applied Social Psychology, Vol. 22, No. 14, Pp. 1111-1132. Doll, J.; Hendrickson, A. & Deng, X. (1998). Using Davis's Perceived Usefulness and Ease-of-use Instruments for Decision Making: A Confirmatory and Multi-Group Invariance Analysis. Decision Sciences, Vol. 29, No. 4, Pp. 839-869. Fishbein, M. & Ajzen, I. (1975). Belief, Attitude, Intentions and Behavior: an Introduction to Theory and Research. Boston: Addison-Wesley. Gikas, J. & Grant, M. (2013). Mobile Computing Devices in Higher Education: Student Perspectives on Learning with Cellphones, Smartphones & Social Media. The Internet and Higher Education, Vol. 19, Pp. 18-26. Hair, J.; Black, C.; Babin, J. & Anderson, E. (2010). Multivariate Data Analysis.USA: Pearson. Hamid, S.; Waycott, J.; Kurnia, S. & Chang, S. (2015). Understanding Students' Perceptions of The Benefits of online Social Networking use For Teaching and Learning. The Internet and Higher Education, Vol. 26, Pp. 1-9. Irwin, C.; Ball, L.; Desbrow, B. & Leveritt, M. (2012). Students' Perceptions of Using Facebook as an Interactive Learning Resource at University. Australasian Journal of Educational Technology, Vol. 28, No. 7, Pp. 1221-1231. Isik, F. (2013). Comparison of The use of Social Network in Education Between North and South Cyprus. Procedia-Social and Behavioral Sciences, Vol. 103, Pp. 210-219. Java, A.; Song, X.; Finin, T. & Tseng, B. (2007). Why We Twitter: Understanding Microblogging Usage AndCommunities. Procedings of the Joint 9th WEBKDD and 1st SNA-KDD Workshop, 12 Agust 2007, Pp. 56-65. Koh, J.; Kim, Y.; Butler, B. & Bock, G. (2007). Encouraging Participation in Virtual Communities. Communications of the ACM, Vol. 50, No. 2, Pp. 68-73. Ma, Q.; Chan, A. & Chen, K. (2016). Personal and Other Factors Affecting Acceptance of Smartphone Technology By older Chinese Adults. Applied Ergonomics, Vol. 54, Pp. 62-71. Miloševic, I.; Ivkovic, D. & Arsic, S. (2015). Facebook as Virtual Classroom: Social Networking in Learning among Serbian Students. Telematics and Informatics, Vol. 32, Pp. 576-585. Moon, J. & Kim, Y. (2001). Extending the TAM For A World-Wide-Web Context. Information & Management, Vol. 38, Pp. 217-230. Pikkarainen, T.; Karjaluoto, H. & Pahnila, S. (2004). Consumer Acceptance of Online Banking: Technology Acceptance Model. Internet Research, Vol. 14, No. 3, Pp. 224-235. Preece, J. (2001). Sociability and Usability in Online Communities: Determining and Measuring Success. Behaviour & Information Technology, Vol. 20, No. 5, Pp. 347-356. Racthman, P. & Firpo, D. (2011). Using Social Networking Technology to Enhance Learning in Higher Education: A Case Study Using Facebook. Proceeding of 44th Hawaii international Conference on Systems Sciences, 4-7 June 2011, Pp. 1-10. Sanchez-Prieto, J.; Olmos-Miguelanez, S. & García-Penalvo, F. (2016). Informal Tools in Formal Contexts: Development of a Model to Assess the Acceptance of Mobile Technologies among Teachers. Computers in Human Behavior, Vol. 55, Pp. 519-528. Sari-Motlagh, R.; Ebrahimi, S.; Nikfallah, A.; Hajebrahimi, S. & Shakiba, B. (2016). Lifelong Learning In Practice: The age of Discussion Through Social Media. European Urology, Vol. 69, No. 6, Pp. 1162-1163. Selwyn, N. (2012). Social Media in Higher Education. London: Routledge. Wang, J.; Jackson, L.; Wang, H. & Gaskin, J. (2015). Predicting Social Networking Site use: Personality, Attitudes, Motivation and Internet Self-Efficacy.Personality and Individual Differences, Vol. 80, Pp. 119-124.